languagehat.com : Sixteen Years of Languagehat. Amazingly, it’s sixteen years since the beginnings of LH. I didn’t expect it to last six months, but here we all are, and it’s the “we” part that keeps it going — the dialogue, the back-and-forth, the heteroglossia, if you will. I never understand what the fun is in simply broadcasting one’s opinions and not caring what anyone has to say about them. How would I have learned so much without all you Hatters to set me straight when I shoot off my mouth? I guess there’s an egregore around here, if my glimmerings of incipient understanding of that esoteric expression are correct. Anyway, thanks for your support over the years; I miss those who are gone, and I welcome those who show up for the first time and have something to contribute, whether that be thoughts, jokes, questions, or a well-turned phrase. Let’s keep the conversation going as long as we can! Happy blog anniversary, Languagehat! I’m glad you kept going after those first six months. Wonderful. Thanks for all of it. Happy anniversary! I don’t remember exactly when I discovered Languagehat, and I have a feeling now that it has always been here. There is no site like this, and never will be: language-drunk, erudite, witty and warm. Thanks for all these years of being here for us! I think the egregore is generated by the karass. Just as the doshes are distimmed by the gostak. Congratulations on your anniversary blogging! Congratulations on your anniversary! And, thank you for enlightening us for all this time. Happy anniversary! Sixteen very good years. BTW, what does edition mean below? Does it apply only to whisky? A much sought-after single malt with the massive peat-smoke that’s typical of southern Islay – but also offering richness and a dryness that turns it into a truly interesting tipple. The 16 year old has truly become a benchmark Islay dram from the Lagavulin distillery. If you’re looking for a food pairing for this beauty, try intensely flavoured salty blue cheeses, which complement the intense, peat rich, sweet and salty character of this Lagavulin edition wonderfully. For some reason they have taken to calling particular versions of single-malts “editions,” presumably because it sounds so impressive; I don’t know when it started. Used to be called a bottling, didn’t it? I don’t follow whisky much these days, but it used to be that the literature from the distilleries acknowledged that they didn’t just take the first ten casks of a certain age and fill a lorry-load, but that casks varied and there was a process of selection to get a certain recognizable product. It’s not much of a stretch to call that ‘editing’. BTW, I think of 16 as a less-commonly used age in the expensive-Scotch business than e.g. 12 or 15 or 18, but there are more instances out there of it than I would have supposed. How much this reflects quasi-scientific views about optimal aging versus more marketing-perception-driven factors I couldn’t say. 十六周年快乐！Really, really thanks for the wonderful decade that I spent with the Hattites. Well, here the single-malt divisions are: up to 12 years, 13 to 19 years, and 20 years and older. كل عام وأنت بخير! Thanks for keeping this going so long, and may there be many more to come. I didn’t expect it to last six months, but here we all are, and it’s the “we” part that keeps it going — the dialogue, the back-and-forth, the heteroglossia, if you will. Oh, let’s be accurate; it is your willingness and motivation to post something worth reading every day that keeps it going. And that is magnificent, thank you for it! Well, it’s a practical thing; knowing me, if I don’t post every day but wait for something really good to come along, the blog will die on the vine. So I post good stuff I happen to run into, and in between I post whatever comes my way, and it’s a great help that people send me links they think would be useful LH material! Language hat is finally old enough to watch “Bad Santa” in Ireland! Congratulations! Congratulations to what ended up being the best language blog anywhere (and the most idiosyncratic one, too). Thank you for your hospitality, and for keeping the canapés coming. Congratulations, LH – I’m glad you’re still around! Congratulations and thanks for enlarging my view of language (and being so entertaining about it) all these years. I’m glad you’re still here and hope you’ll be around a lot longer! And the same to you, old friend! Looking forward to the next 16 years, old boy! There are still places where you can read the comments, a couple where they are interesting even. And there is languagehat, that has topped the unread list in my feedreader for years because I need to let every article marinate for a few months, so I can read all the interesting discussion at once. Thanks hat and everyone who makes this place what it is. Glad we are a karass and not a granfalloon. Thanks for LH, Language. Like the tides, it can be depended on. I especially miss two former commenters, witty and erudite professors: Noetica and Anthony Ossa-Richardson (I’ve forgotten his nom de chapeau). I meant to congratulate yesterday, but I wanted to add something deep and original. And then I figured I don’t have to, and that’s what I want to say. This may be the only place on the whole Internet where a comment always will be read and understood in the best way possible — as a serve for others in a cooperative game. I for one am very grateful this blog remains active and with its great community. How do new readers these days discover LH? Is Hat promoting it on social media, or is the audience mainly those who discovered it back in the heyday of blogs? Well, I’m a relatively new reader (having arrived here after the 2013 move), but I’m also a sufficiently non-new reader that I don’t actually recall how exactly I discovered Language Hat. I was compelled by popular demand to create a Twitter account that would automatically post what I put on LH, but otherwise no, no promotion. Enough people seem to find their way here to keep the conversation going, but god forbid it should become Popular — the last thing I need is an influx of bots and trolls. Noetica has already departed in a blaze of ignomy. I will miss him. We will all miss him. I wish it weren’t so easy for some people to take offense. If this were a sitcom, there could be a special ratings-boosting anniversary/reunion episode in which people who had stormed off and or been pushed out after creating too much agita for the rest of the cast could return for one night only, with hilarity ensuing. I’m not sure that’s feasible for the genre we’re working in, however. I’m still waiting for that guy who had interesting things to say about jazz somewhere around 2003-4 to return from his gig and pick up where he left off. Čestitam! Još barem šesnaest godina. And, of course, read and the camel’s nose woman. Čestitam! Još barem šesnaest godina is way beyond my capabilities. Ah, the old ‘detect the language’ trick! Yʋma pinɛyuobu ka ti sɔnsid nɛ. Ti pʋ’ʋs ya bɛdegʋ, Pian’ad Zupibiga! This is fun to parse using the excellent grammar you’ve written. Can you parse it for the lazybones among us? Like me? Sixteen years we’ve been conversing. Thanks very much, Headgear of Speech! Thanks! Which is the Headgear and which the Speech in Pian’ad Zupibiga? I love it — what a great word! Pian’ad Zupibiga would be a he’ll of a moniker. In the wild I might have guessed Catalan-Basque, which just adds to the awesomery. Congratulations, Languagehat! Hope to be reading you daily for a long time to come! Thanks, and I hope for the same! Continuing the single-malt theme, is shoogle ever used outside the shoogle box? How do new readers these days discover LH? Probably the traditional way: Google accidentally finds it for them. I can’t remember how I found it at least 10 years ago. Y @ David Eddyshaw: This is fun to parse using the excellent grammar you’ve written. I googled it up, picked the revised version*, and after a couple of days I’m at page 37. The orthography is weird, but that’s nothing against the morphophonemics. I’m in awe. *) I just noticed that David’s been revising it monthly, and I’ve been reading a version from January. Here’s the July 2018 edition. The orthography is basically that of the latest Bible version. It’s admittedly odd but usable with a bit of diacritic-adding, and I would like the grammar to be as accessible to Ghanaian readers as is consistent with its pretty technical nature. Or at least not to put anybody off gratuitously. Unfortunately I altogether lack the skills necessary for a paedagogical grammar. You’ll notice I’m well into the comparative side of Oti-Volta linguistics: I should probably spin all of that off into a separate paper, as it regularly tries to take over (I’ve just spent much of the day showing how the Kusaal word for “warthog”, dɛɛg, is regularly related to the Gulimanchema duolo “pig”, which gave me great pleasure but has a somewhat tangential bearing on Kusaal grammar as such …) Existing studies of the family are well out of date, now that a lot more high-quality lexicographic material is out there. Constructive criticisms are very welcome from any hardy souls who read it, BTW. My email’s in there. Congratulations, and please keep it going! This site has become a staple for me. el albornoz: Noetica has already departed in a blaze of ignomy. I missed that. I just remember him once writing that he was too busy to continue commenting. Can anyone provide a link? I can’t find it by searching. Camel’s nose left Chicago. She was last heard of in Vietnam or Australia pursued, she said, by a local Chicago mafia. They wanted to bump her off for being so extremely irritating. The post was Two Spaces Are Better Than One from May. Noetica’s coming in here. Seriously? And the gangsters, too? 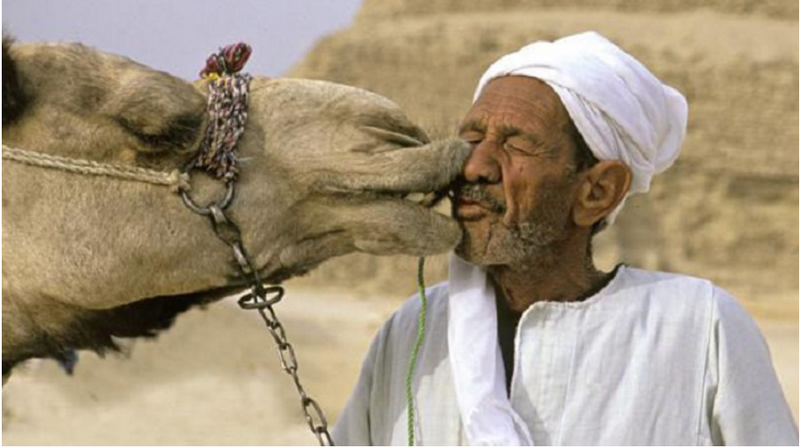 I found a hilarious photo of someone (it would be irreverent to call him “LanguageTurban”) kissing a camel. Both the camel and Dr Turban had whiskers. I will not, under pain of excommunication from the LH community, disclose the whereabouts of the photo. Oh! That’s a depressing thread to read. I’m sorry it had to end as such a trainwreck. But thanks for the link, Trond. Camel’s nose changed her name to something like Scott McGarrigle (it wasn’t that) that was intended to be gender-ambiguous, and took off on a $5/day world tour. This she revealed on Facebook, which I recently renounced and I’m not sure how it ended. I think John Emerson and others are probably still fb friends with her. She never said why this mafia was chasing her but she did sound scared. Hat, where is my $5? I sent it to AJP, you’ll have to ask him. Photo is at Camel nose pegs: to use or not to use, 3rd photo down. Others please refrain from peeking. At a wild guess, the thing I obviously haven’t seen since I didn’t peek would fall in the millinery category of “hankies with knots in them”. Well, this is a link to the same photo, but for a wider audience. The camel has a narrow David-Nivenlike moustache. According to the photographer the kissing incident took place near the Sphinx in Cairo. Here’s another Perhaps I’m wrong but I’m not sure whether something that can be unwound, a strip of cloth, is rightly called a hat. A Hat has permanence. Wow, looks like I’m late to another celebratory anniversary. All I can I say is that although my life hasn’t allowed me to hang out in these particular haunts as often as I’d like, nor correspond as often I’d like with the many friends I’ve made here, I love this shabby little dive and all its colorful degenerate denizens. It’s oft been the only place I could go for a shot, sure I wouldn’t risk drinking turpentine. Life is finally improving, albeit frustratingly slowly, but trajectory isn’t in doubt. So I plan to to visit more often and catch up with the people here who, even if we’ve only shared a few emails, have through their kindness helped me over the years when I really needed it. Hat himself knows he’s the man, creating LH and doing more for me since I met him a dozen or so years ago than I could ever imagine, and if he doesn’t know, it’s about damn time he realized it. Happy Birthday, LH! What’s the origins of lollapalooza? And when did the suffix -palooza start a life of its own? Held at the Hyatt Regency’s Grand Ballroom in Chicago, Whiskyfest is literally a whisky-palooza with more whisky fun than you could possibly cram into a single night. With over 50 different whisky companies represented, Whiskyfest is an overwhelming opportunity to sample an amazing array of whisky, bourbon, and more from many of the major distillers in the world. Here’s Dave Wilton’s explanation as of 2007. The turpentine and the absinthe, if there’s any confusion there — using turpentine was a cheap way to make passable gin in the late 19th century, especially in East London, and it made men blind. Apologies if my lazy riff left anyone confused. As to other the other sentiments, I just had two badly needed teeth pulled (a wisdom up top and one inward on the bottom right, “#31” to dentists), with complications, and though I’m feeling pretty good now — just a little sore — the month leading up to the surgery was hell. Talk soon, I’m sure. Hat, shoot me an email. How’s things, you know? Congratulations on surviving the dental surgery — that’s no fun at all!